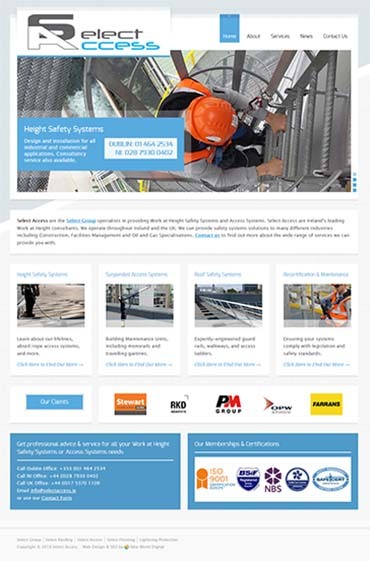 Select Access is the specialist Height Safety wing of the Select Group. The group also includes Select Roofing, Select Flooring, and Lightning Protection Ireland. Select Roofing was the original company. We built that website back in 2013 and have maintained it ever since. It was only natural then that the directors should return to us when they required new websites for new wings of the group. We were delighted with their vote of confidence in us. In consultation with company management, we scoped out a vision for the new site. They were eager that all group sites would have a uniform look, so we determined to build it in the style of the existing Select Roofing site. We also had in-depth discussion on the optimum menu structure and page titles. We based decisions here on intensive market research and keyword research. Next came content creation. This presented certain challenges with this particular build, due to the complex nature of the core business of Select Access. Our copywriter had to take brochure material that was long on technical data but short on ‘ordinary’ text, and transform it into SEO-friendly copy. He achieved this by researching further around the core topics, and crafting keyword-optimised text with his findings. The resulting text is perfectly pitched at the site’s target audience of engineers, architects, etc., while satisfying Google too. Checks and re-checks of text followed, before we passed the material on to our designer for the build itself. The actual website design was relatively straightforward in this case, as we had already decided to base it on Select Roofing. Our designer expertly made the material fit that design, to the client’s 100% satisfaction. We gave the back end of the site all our customary SEO attention as the build progressed too. This included writing metadescriptions according to new Google parameters, and optimising images too. Our SEO work is continuing as part of a monthly digital marketing package.